Chopped peanuts and crumbled bacon add texture to a classic coleslaw blend in this simple yet crowd-pleasing recipe. Mix Miracle Whip and sugar until blended. Combine remaining ingredients in medium bowl. Add Miracle Whip mixture; mix lightly. 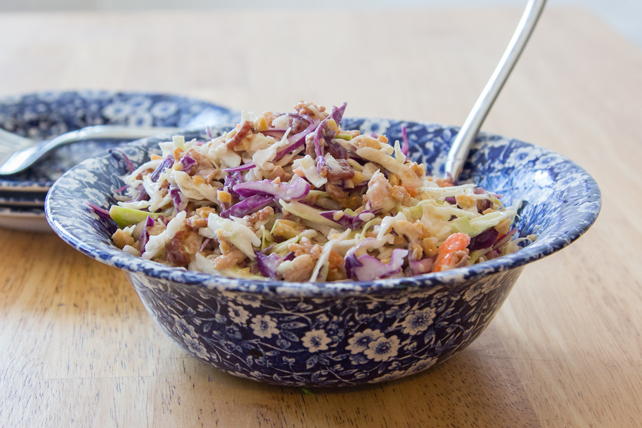 Substitute 4 cups shredded green cabbage and 1 cup shredded red cabbage for the coleslaw blend. Add 1-1/2 tsp. Heinz Apple Cider Vinegar to the coleslaw before chilling.